Normal 3 D vision works because our left eye has a slightly different view of the world from our right eye. 3 D glasses typically have the left-hand optic covered in red and the right hand-optic covered in blue. The 3-D material – a picture or a single frame of a film – has two images printed, one in red and one in blue. When we view this image through the glasses our left eye mainly sees the image printed in red and our right eye mainly sees the image printed in blue. Our brain interprets the differences between the different images as being due to differences n perspective and reconstructs a 3-D view of the scene. Modern 3D movies in cinemas use polarised light rather than the red/blue system. Two images are projected in different polarisation, and differently polarised lenses in the glasses allow each eye to see only one of the images, giving the 3D effect. This system allows full colour images and digital technology allows for better synchronised, and therefore sharper, images. …of course, to learn what polarised light is: Ask A Scientist!! Put on a pair of polarised 3d glasses an look at your face in the mirror. I would expect both lenses to appear black, as in order for you to see your own eyes the light has to pass through 2 perpendicular filters, but in practice this does not happen. Why? Try alternately closing each eye, and one of the lenses appears to go black, the one in front of your open eye. What is happening? Repeat the experiment with the glasses placed backwards i.e. with the ear pieces pointing forwards away from your face, this time no lenses go black, so does that mean that polarised filters behave differently depending on the direction that light passes through them? 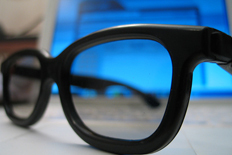 With the glasses placed backwards as above, try looking at an LCD tv or monitor. With the glasses exactly horizontal the tv appears to black out, but at any other angle it is viewable. Repeat the experiment with the glasses on normally over your ears and no such effect is observed. I Thought I understood polaroid filters but obviously not! Any help appreciated. Thanks. What fantastic powers of observation. I will try this tonight when I get home. Here are my first thoughts. B. There are two types of polarising glasses. In one type the left filter allows vertically polarised light through and the right filter allows horizontally polarised light. In the second type, the left filter allows clockwise polarised light and the right filter allows anticlockwise polarised light through. I will assume at first that you have the first type, but actually I think your second observations indicate that you have the second type. 1. When you are looking at the image of (say) your left eye, the light leaves your left eye and travels through the polarising filter in the glasses. Let’s say this light is now vertically polarised. Any image formed of your eye now has to be formed from this vertically polarised light. Your left eye should be able to do this. There is a 180° phase change on reflection but this does not affect the polarisation. The light from your left eye will not be able to pass through the filter over your right eye. Thus your brain will create an image of the scene using information from your left eye and right eye synthesised. Since there is some light coming through, the brain creates an image in which the Polaroid look semitransparent. In fact your left eye is only seeing your left eye, and your right eye is only viewed by your right eye. 2. Looking with one eye of a time. Now I don’t understand this observation. Imagine that you close your left eye. Then light from your eyelid will travel to the filter and this vertically polarised light would be visible by your left eye, but this eye is closed. Your right eye is open but can only see images formed from horizontally polarised light. I would have expected that viewing with your right eye (left eye closed) that the filter over your left eye would appear dark. That appears to be the opposite of what you see. The reason for this is (probably) because you have glasses which are circularly polarising. 3. This is getting too complicated for me to analyse without pictures. The exact results here will depend on how you inverted the glasses i.e. by rotation about which axis. The issue here is that a filter which transits clockwise polarised light from its from front surface, also transmits light the other way. But in order to pass the light entering from its BACK surface needs to ANTI-clockwise polarised. Incidentally this is the basis of many simple LCD displays which place a circularly polarising filter above a mirror. If the substance between the mirror and the Polaroid does not alter the sense of rotation of the polarisation then the device looks dark. If the substance does alter the polarisation then it can transmit light. 4. I don’t understand this, but as I mentioned above, LCD displays use polarisation in their basic technology. how can plain 3d polarised glass work in a simple laptop in 3d movie without any red-blue 3d glass? Because with red-blue 3d glass it is not comfortable to watch a colourfull 3d movie.in redblue glass it is very difficult to recognise the colours. Why am I colour blind? 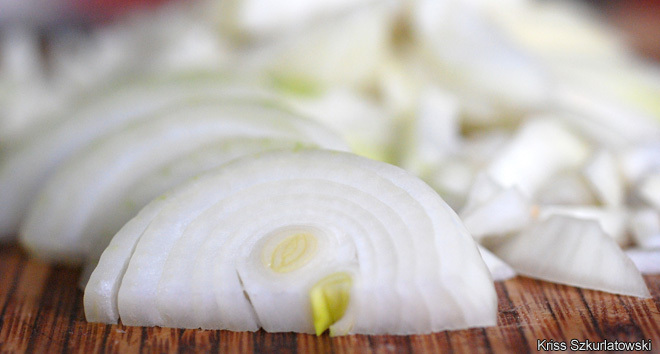 Why do our eyes tear up when cutting onions?